A quick walk round to the Rough Trade record shop and the bloke behind the counter told me of this little band from Swindon who were getting a bit of a rep. And no, they weren’t called Ecstasy, they really were called XTC, and already had a reputation for high energy combined, unlike most punk-era bands, with fine musicianship. Within a few months I would get to see their first gig at the Marquee. Of course what grabbed me most about them was – they had an organist! Since the punk rock scene had exploded one long, noise-filled year before, and I had been frequenting various dives such as the Roxy (where the odd Zeppelin member could be seen skulking in a dark corner, checking out the opposition), I hadn’t seen a single keyboard player. Ah, no wonder the punks had gobbed on me when I played with Wayne. Keyboard player = old fart! Not this keyboard player. Barry Andrews was as skinny as a rake and so was the sound of his stripped-down Yamaha YC-20 organ, which cut through the guitar/bass/drum wall like a dentists drill. What was even cooler was that within a couple of years he skipped XTC to join Robert Fripp’s band, The League of Gentlemen (see previous blog). XTC’s first single, “Statue of Liberty” was (laughably) banned by BBC Radio because of one line: “in my fantasy I sail beneath your skirt” which some bod at the Beeb thought was too rude to be broadcast. Hopefully this ban was well-publicised in the music press, resulting in more sales to those intrigued as to why it was banned, the said idiotic ban thus having, as usual, the reverse effect. Pithily-titled albums followed in quick succession: “White Music,” “Go 2,” and “Drums and Wires,” all with arty, minimal covers, none of them exactly crashing into the charts, but selling respectably enough for the band to keep going. Their sound became less dentist-drillish and more rock, with the addition of new keyboardist/guitarist Dave Gregory and producer Steve Lillywhite, CBE (later of U2/Stones/Beady Eye fame). A fascinating tangential release was “Take Away/The Lure of Salvage” (1980) by one “Mr. 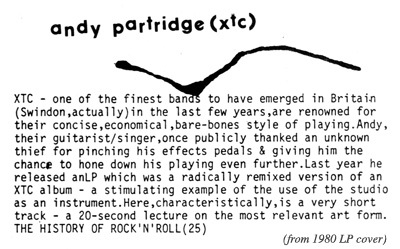 Partridge.” It consisted of dub-style deconstructions of various XTC tracks, and I was encouraged by this discovery that white guys can do dub too (having been marvelling at the black dub I often heard between sets by punk bands at the Roxy and elsewhere). I felt confident that Andy would come up with a fine creative miniature, and duly posted him an invitation. “Come to the Townhouse” came the reply, not long after. XTC were at this brand new, state-of-the-art studio in West London, working on their new album. Andy studied me through his owlish spectacles as I listened to the track for the first time and reacted with the words, “now that really is a miniature!” – for he had made almost the shortest track (a hair under 20 seconds – only beaten by Joseph Racaille’s 14-second epic). Pithy was still the rule, it seemed, and Andy had reviewed the first 40 years of Rock’n’Roll, taken the pith out of it (pun intended) and presented it as this little bonsai of a lecture. The artwork he later sent in for the Miniatures poster epitomised his “Lure of Salvage” approach. It was the back of a cereal packet, with a cutout head of a hippo on it (collect the set! Lion, tiger, zebra, giraffe, elephant, buffalo…). Andy probably did, and perhaps they are now lined up on top of the console in his home studio – like REM’s Peter Buck and the dinosaur collection he sets up onstage at every gig – the kind of quirk that indicate a finely-tuned mind and a nicely childlike approach to life and music). The tidy handwriting on the packet indicates “the first 40 years”. Will 2020 be the time to summarise the next 40? I’ve only ever had serious stage fright once; it was crippling, terrifying, to feel that, minutes before a show, my mind was a complete blank – I had no idea how I’d remember what to play. I literally went white and trembled as if I was standing precipitously at the very edge of Beachy Head. Somehow I gritted my teeth and got out there and it all came back. I still don’t know why it happened. It’s not uncommon – for example it ruined the performing career of Paul Ryan. The pressure of fame was too much so he stayed at home and instead, wrote brilliant, massive hits for his brother Barry. 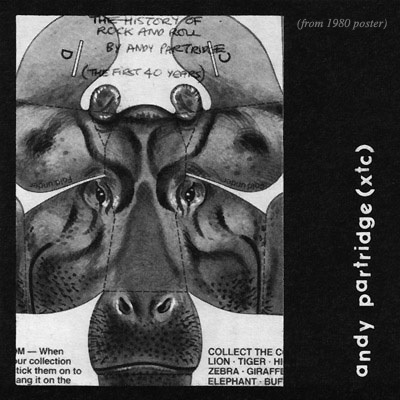 With Andy Partridge, one night in 1982 he had an attack of nerves before a show at the Hollywood Palladium, cancelled the performance, and has never set foot on stage since (except for one show shortly after). Apparently it was due to his wife having thrown away his supply of Valium. According to the band’s biography, he had been dependent on the drug for 13 years, since the time he was 16 and his parents went through a divorce. (Please forgive me if there are any inaccuracies in this account). How sad that music on its own may not have been enough to nourish him, as it was for me. My parents also divorced when I was 16. However, I wasn’t prescribed Valium until 1977 after 9 straight years of the over-indulgent rock’n’roll life had resulted in some depression, insomnia, lethargy. I floated around on the little yellow pills for three months then thought, this is ridiculous, and an abrupt lifestyle change to include acupuncture, meditation and organic veggie food (regular delicious visits to Cranks) had me, within weeks, feeling better than I ever had since I turned pro. I sincerely hope Andy is no longer dependent on anything except cutting out animal’s heads from cereal packets. Even without performing live, he certainly has maintained a brilliantly inventive career, expanding into acting, talk shows and book writing. Artists he has worked with as collaborator, producer, composer include Robyn Hitchcock, Harold Budd, The Residents, Blur… He even wrote four songs for a Disney film (business difficulties stiffed the project) and was approached for a possible collaboration with Brian Wilson – another introverted genius. 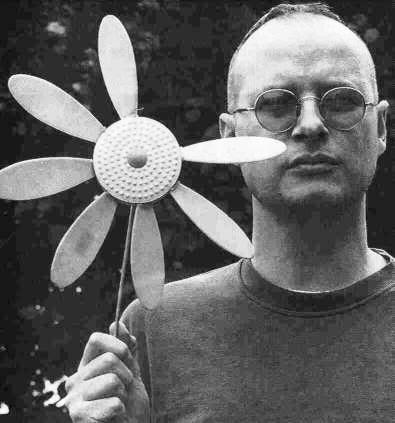 Lately he has has been courageously dealing with the problem of tinnitus (I feel very fortunate that I don’t have it, just some loss in the high frequencies – surely Mott were at least as loud as XTC?). I am sure much more music is to come from the versatile Mr. Partridge. And I’d be fascinated to hear what musical one-liners he’d come up with to symbolise the three decades that have elapsed since his miniature – he still has 40 seconds free on the slate. Next up: time for a quick one. A wonderful, creative giant. I didn’t discover XTC until 95. What joy at working through their entire catalogue. For me, Partridge and McAloon are our 2 greatest post Lennon/McCartney writers.